Potatoes are a versatile root vegetable and a staple food in many households. They are an underground tuber that grows on the roots of the Solanum tuberosum plant (1). Potatoes are relatively cheap, easy to grow and packed with a variety of nutrients. Here are 7 health and nutrition benefits of potatoes. Potatoes are an excellent source of many vitamins and minerals. It’s also important to note the skin of the potatoes contains a great amount of the vitamins and minerals. Peeling potatoes can significantly reduce their nutritional content (1, 3). SUMMARY Potatoes are packed with vitamins and minerals, though the variety and preparation method can affect the nutritional content. Potatoes are rich in compounds like flavonoids, carotenoids and phenolic acids (4). These compounds act as antioxidants in the body by neutralizing potentially harmful molecules known as free radicals. When free radicals accumulate, they can increase the risk of chronic diseases like heart disease, diabetes and cancer (5). For example, a test-tube study found that the antioxidants present in potatoes may suppress the growth of liver and colon cancer cells (6). Studies have also found that colored potatoes like purple potatoes can have three to four times more antioxidants than white potatoes. This makes them potentially more effective at neutralizing free radicals (7, 8). However, most of this evidence is from test-tube studies. More human-based research is necessary before making any health recommendations. 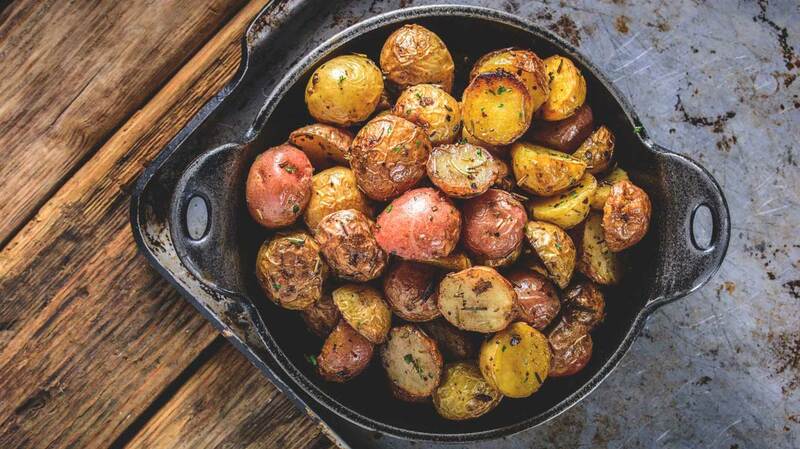 SUMMARY Potatoes are a good source of antioxidants, which may reduce the risk of chronic diseases like heart disease, diabetes and certain cancers. However, more human-based research is required before making any recommendations. Potatoes contain a special type of starch known as resistant starch. This starch is not broken down and fully absorbed by the body. Instead, it reaches the large intestine where it becomes a source of nutrients for the beneficial bacteria in your gut (9). Research has linked resistant starch to many health benefits, including reducing insulin resistance, which, in turn, improves blood sugar control. In an animal study, mice fed resistant starch showed reduced insulin resistance. This means their bodies were more efficient at removing excess sugar from the blood (10). A study of people with type 2 diabetes found consuming a meal with resistant starch helped better remove excess blood sugar after a meal (11). In another study, ten people were fed 30 grams of resistant starch daily over a four-week period. Scientists found that resistant starch reduced insulin resistance by 33% (12). Interestingly, you can also increase the resistant starch content of potatoes. To do this, store boiled potatoes in the fridge overnight and consume them cold (13). SUMMARY Potatoes contain resistant starch, which may help reduce insulin resistance. In turn, this can help improve blood sugar control. The resistant starch in potatoes may also improve digestive health. When resistant starch reaches the large intestine, it becomes food for beneficial gut bacteria. These bacteria digest it and turn it into short-chain fatty acids (14). Resistant starch from potatoes is mostly converted into the short-chain fatty acid butyrate — the preferred food source for gut bacteria (15, 16). Studies have shown that butyrate can reduce inflammation in the colon, strengthen the colon’s defenses and reduce the risk of colorectal cancer (17). Moreover, butyrate may aid patients with inflammatory bowel disorders, such as Crohn’s disease, ulcerative colitis and diverticulitis (18). That said, most of the evidence surrounding butyrate is from test-tube or animal studies. More human-based research is necessary before making recommendations. SUMMARY Resistant starch in potatoes is a source of nutrition for beneficial gut bacteria. They convert it to the short-chain fatty acid butyrate, which has been linked to reduced inflammation in the colon, improved colon defenses and a lower risk of colorectal cancer. The gluten-free diet is one of the most popular diets worldwide. It involves eliminating gluten, which is a family of proteins found in grains like spelt, wheat, barley and rye. Most people do not experience adverse symptoms from consuming gluten. However, people with celiac disease or non-celiac gluten sensitivity can experience severe discomfort when consuming foods that contain gluten. Symptoms include sharp stomach pain, diarrhea, constipation, bloating and skin rashes, just to name a few (19, 20). If you follow a gluten-free diet, then you should consider adding potatoes to your diet. They are naturally gluten-free, which means they won’t trigger uncomfortable symptoms. While potatoes are gluten-free, many common potato recipes are not. Some potato dishes that contain gluten include gravy, some au gratin recipes and potato bread. If you have celiac disease or a non-celiac gluten sensitivity, be sure to read the full list of ingredients before eating a potato dish. SUMMARY Potatoes are naturally gluten-free, which makes them an excellent food choice for people with celiac disease or a non-celiac gluten sensitivity. Aside from being nutritious, potatoes are also incredibly filling. In one study, 11 people were fed 38 common foods and asked to rate foods based on how filling they were. Potatoes received the highest fullness rating of them all. In fact, potatoes were rated as being seven times more filling than croissants, which were ranked as the least filling food item (21). Foods that are filling may help you regulate or lose weight, as they curb hunger pains (22). Some evidence shows that the potato protein, known as potato proteinase inhibitor 2 (PI2), can curb appetite. This protein appears to enhance the release of cholecystokinin (CCK), a hormone that promotes feelings of fullness (23). SUMMARY Studies have shown that potatoes are among the most filling foods. They may increase the levels of fullness hormones, such as cholecystokinin (CCK). Not only are potatoes healthy, but they are also delicious and versatile. Potatoes can be prepared in many ways, including boiled, baked and steamed. However, frying potatoes may dramatically increase their calorie content if you use a lot of oil. Instead, try slicing potatoes and then roasting them in the oven with a light drizzle of extra virgin olive oil and a sprinkle of rosemary. Make sure not to remove the skin of the potatoes, as most of the nutrients are located there. This will ensure you receive the maximum amount of nutrients from the potato. SUMMARY Potatoes are delicious, versatile and easy to add to your diet. Try boiling, baking or steaming them and consuming them with the skin intact. Potatoes are rich in vitamins, minerals and antioxidants, which make them very healthy. Studies have linked potatoes and their nutrients to a variety of impressive health benefits, including improved blood sugar control, reduced heart disease risk and higher immunity. They may also improve digestive health and combat signs of aging. Potatoes are also quite filling, which means they may help you lose weight by curbing hunger pains and cravings. All in all, potatoes are a great addition to your diet in moderation. They are also naturally gluten-free, which means they can be enjoyed by almost everyone.